Aortic dissection is a complex disease affecting the aorta. 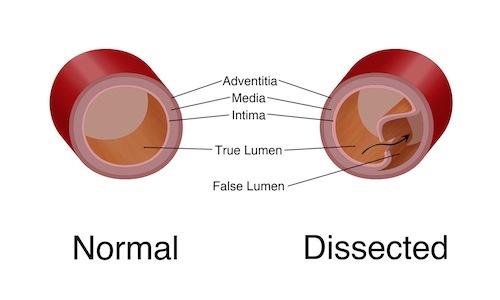 It is the term given to the condition where blood tears between the layers of the wall of the aorta and courses along the tissues of the vessel wall in a "false lumen", see the illustration below. Dissection is strongly associated with uncontrolled high blood pressure, generalised vascular disease, and some rare inherited or genetic tissue disorders. It can, of itself, cause dilatation (aneurysm), but can have other effects that directly compromise the blood flow to vital organs and limbs. ​Acute, sudden, dissection is a painful and potentially life threatening condition. It is often signaled by sudden ripping pain in the chest and back. The symptoms are rarely ignored and the sufferer usually attends the nearest emergency department by ambulance. Depending on the direction of the tear, towards or away from the heart, the patient may require emergency open heart surgery (by Cardiac surgeons) or the attention of a Specialist Vascular Surgeon. Frequently, the initial management of an aortic dissection is medical rather than requiring surgery. Vascular specialists usually manage the medical treatment of dissection. The treatment is hospital based, and requires close monitoring and continuous medication through drips. Deterioration with medical management will often prompt definitive surgical treatment. ​After the acute episode has resolved, and provided the dissection hasn't progressed to either a significant aneurysm or caused other complication, patients are currently managed with ongoing medicine for blood pressure control and regular follow-up scans. These scans are to detect the development of aneurysm of the weakened wall or another complication early to allow for safer, planned, treatment. Tight blood pressure control is vital treatment with or without surgical intervention.